The DMM (digital multimeter) is a basic measurement tool for nearly every electrical engineer and many other engineers. With the push to constantly improve power efficiency in electronic designs comes a need to not only measure voltage and current, but to dynamically see them as well. 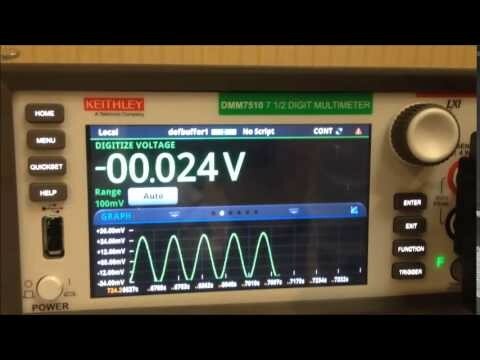 Keithey’s DMM7510 combines a 7½-digit DMM with an 18-bit, 1 Msample/s digitizer, which lets you see measurements both numerically and graphically. Having the ability to see waveforms lets you uncover problems that used to require an oscilloscope. The DMM7510 also features a 5-in. capacitive touch screen. You can use gestures such as swipes and pinches to sweep though setup menus or zoom in or out of waveforms. I tried it firsthand just prior to today’s product launch, as the short video below shows. 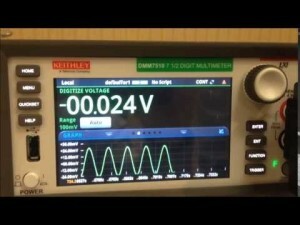 The digitizer lets you measure voltage from 1 µV to 1010 V and current from 0.1 nA to 10.1 A. The DMM7510’s rear panel includes LXI, USB, and GPIB ports for remote control. It also includes fuses when making current measurements, a digital I/O port, probe inputs, and a trigger input. Two additional ports lets you daisy-chain instruments together to increase measurement capacity, a handy feature if you need to automatically simultaneously measure voltage and current using two or more meters. Keithley also provides free KickStart software for controlling the instruments from a PC. The company also provides LabVIEW, IVI-C, and IVI-Com drivers. For use in automated products settings, the DMM7510 is available without handles or without a front panel.